I found this in a sketchbook/journal from 1993. 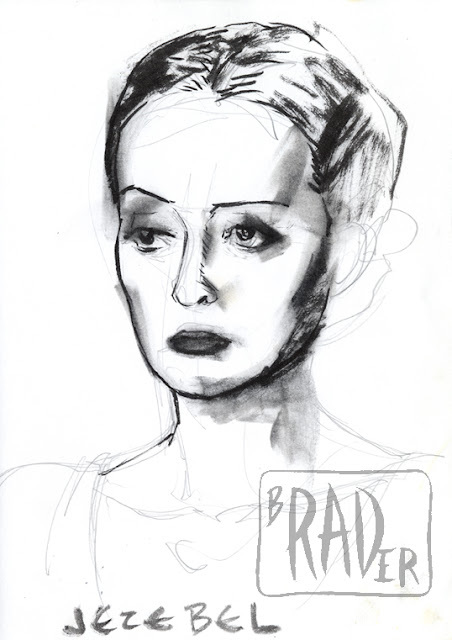 It’s a sketch from a freeze-frame of Bette Davis from the movie “Jezebel”. I believe it was done with a Japanese fountain brush dispensing water based ink, hence the artful smearing. I saw “Jezebel” for the first time in 1981, at the New Beverly Theatre in Los Angeles. Earlier in the day, I had done my weekly comics buy, which included the then-latest issue of Frank Miller’s “Daredevil”, which I hadn’t had time to read before going to the movies. I mention this because it goes a long way toward demonstrating how one’s tastes can change over time. I was so uninvolved in “Jezebel”, and so into what Miller was doing on “Daredevil”, that I left the theatre in the middle of the movie, went out to the lobby to read the comic book, then went back into the theatre to watch the remainder of the movie. Nowadays, I find it difficult to look at Miller’s artwork, and “Jezebel” is one of my favorite movies. The director, William Wyler, is one of my 10 favorite directors, especially for the movies he made with Bette Davis (“Jezebel”, “Little Foxes”, and “The Letter”).